Tide's new Eco-Box detergent container looks like a box of Franzia. 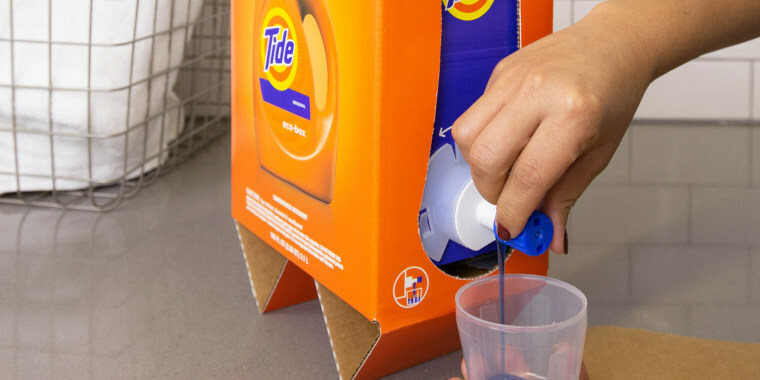 Tide just revealed a newly designed detergent container and, yes, it looks very much like boxed wine. People pointed out the resemblance almost immediately after Tide announced the new Eco-Box, which uses less plastic and is more environmentally friendly to ship than regular bottles of detergent. This all comes about a year after the Tide Pod challenge swept the internet. As part of that dangerous, viral trend, some people ingested Tide detergent pods and filmed the experience to earn social media cred. Teens — and some adults, too — prepared the pods in various ways, from making bowls of Tide pod cereal to actually sauteing them to serve the mini detergent containers like a gourmet dish. The trend was bizarre and also extremely dangerous. Eating laundry pods can be fatal. At least 8 people have died in the U.S. after ingesting liquid laundry packets, though these deaths were not related to the Tide Pod challenge. Those who died were either young children or adults with Alzheimer's or dementia, according to the U.S. Consumer Product Safety Commission. Some young children under the age of 5 may have mistaken the colorful tablet for candy or another edible item. Other severe side effects of eating Tide pods — which are poisonous to ingest, remember — include vomiting, loss of consciousness, coma, fluid in the lungs and cardiac arrest, according to The American Association of Poison Control Centers. Pod manufacturers agreed to make changes to their products, which included adding a bitter tasting packet coating and using containers that were harder to open, according to a Wall Street Journal report. In light of all that, some people are questioning why Tide decided to make their detergent look edible once again (or drinkable, as the case may be). A spokesperson for Tide’s parent company, Procter & Gamble, reminded consumers that detergent is obviously not meant to be eaten and that the new Eco-Box clearly indicates its soapy contents. So, to recap: Never eat or drink laundry detergent, no matter how delicious it may appear.